This gorgeous Victorian-era cottage has all the charm of its 100+ years, yet all the modern conveniences, including fully equipped gourmet kitchen, 2 private bedrooms, 2 full baths, including one with Jacuzzi tub, and is very tastefully decorated. Located in the historic, quiet, and safe Uptown neighborhood of Carrollton, directly on beautiful Palmer Park, the house is just one block from the streetcar line on historic Carrollton Avenue, the bus line on Claiborne or the taxi stand on the corner! Local grocery Robert's (pronounced ro-bears) and a 24 hour Walgreen’s are just one block away, not just great places to get staples but Robert’s also serves some of the best prepared local cuisine daily. Mere blocks from historic, yet hip Oak Street, there are dozens of nearby restaurants, bars, coffeehouses, shops and, of course, plenty of music! Just minutes to Audubon Park, the Universities, Downtown, the Superdome and the French Quarter by streetcar or bus. Bringing your own car? There’s a 2 car driveway. Bedroom 1 has a queen bed with Tempurpedic mattress and an ensuite bath with Jacuzzi and shower. Bedroom 2 also has a queen bed with Tempurpedic mattress and a separate, private full bath with tub and shower. There’s a large fenced backyard and a stunning 12’ x 24’ covered porch with ceiling fans and lights, complete with outdoor living room and dining table. There’s even a doggie door if you want to bring your dog! There's central air and heat, ceiling fans in every room, dishwasher, washer and dryer, gas range, microwave, 12 foot ceilings, tons of natural light, security system, 50' flat screen TV, stereo, DVD player, a desktop computer and WiFi. I'm a native New Orleanian, yet I have traveled the globe. I'm a retired attorney who now works in the real estate industry in my beautiful neighborhood of Uptown. A couple of years ago when my father passed away, my sister and I became responsible for caring for our 90 year old mother. Consequently, I stay at my mother's house in the suburbs much of the time. After having happily traveled using VRBO myself for 20 years, the idea came to me to start using my own home for short term rentals and VOILA'! My own little "cottage industry" (pardon the pun!) was born. My house is nestled amongst the beautiful oak trees that have made Uptown New Orleans famous, right across the street from Palmer Park, where you can catch the streetcar and head toward the French Quarter or, if you're in a hurry, there's also a cab stand or the bus stop just across the park. If you want the real feel of living in New Orleans in its most sought-after neighborhood, in a real historic Victorian home, then The Dubliner is for you! I allow dogs (sorry, no cats) and there's a doggie door and a great secure, fenced backyard for them - and you! Definitely plan to spend at least a little time enjoying the gorgeous 12' x 24' back porch; there's an outside seating group to use as a den, or take your dinner outside (after preparing it in my fantastic open, large gourmet kitchen or get it from Robert's grocery down the block, or, heck - take it out if you want from one of the many, many restaurants within walking distance of the house on Carrollton Avenue or Oak Street). In the historical neighborhood of Carrollton in Uptown New Orleans, close to fabulous shops, restaurants, bars and music of New Orleans, near the Universities. Clean linens will be on the beds. Extras in the linen press in the master bedroom. Medium size stackables; in the hall closet. Plenty will be laid out in each bath. Extras kept in the master walk-in closet. Stainless Steel fridge/freezer with ice maker. Stainless Steel 4 gas burner w/ large, built-in griddle in the middle. Stainless Steel gas, one unit slide-in range. Everything you could possibly need to prepare a large, gourmet meal! Kitchen Island with two stools and 6 person dining table outside on the covered porch. Cox Contour. Netflix and Amazon Prime available through the Roku; log in with your own account. Large, securely fenced backyard for your enjoyment AND your dogs! HUGE 12' x 24' gorgeous covered wood deck with gorgeous outdoor living area and dining table for 6.
nearby at Audubon Golf course (public). Reservations recommended. Though the house is all on one level, there are 3 steps to get in, as it's an old New Orleans raised house. 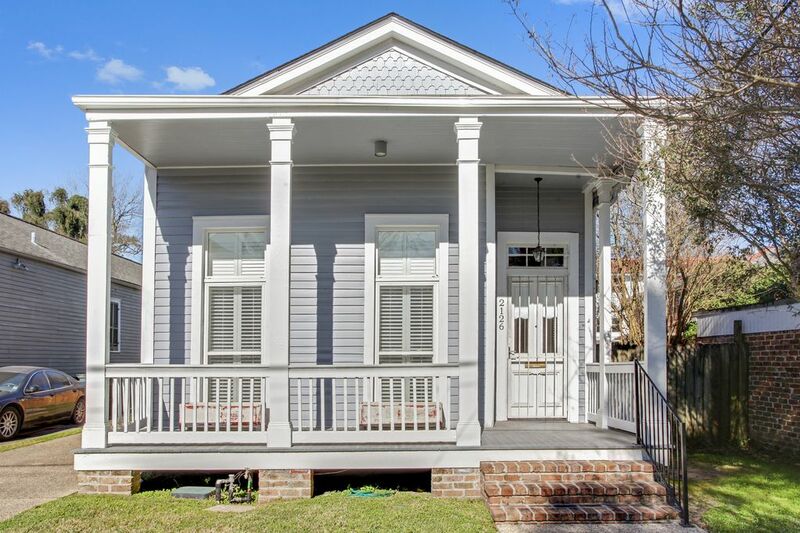 Beautiful, safe and quiet Uptown neighborhood, with quick access to all NOLA has to offer! Take the streetcar or bus (right on the adjacent park) if you want to leave your car at home. Family friendly or enjoy a secluded, romantic vacation. The home was perfect. The back porch was used daily. The area was nice, with much to do within walking distance. We felt safe and well taken care of! The Dubliner was the perfect choice! Loved the house and the location. Absolutely perfect lodging in NOLA!! If you plan on visiting NOLA check out the Dubliner. Great quiet neghborhood, close to rail for easy transportation downtown. This home was spotless, had a great homey feel and an awesome back deck and private back yard. I cannot say enough about not only the home but also tha owner Jacque. I will definately stay at the Dubliner next time I am visiting NOLA. Thank you so much Jacque! This "shotgun" style home had everything we needed for a nice stay in New Orleans. The rooms were comfortable and spacious. It easily slept 2 couples. The master suite has a nice large walk in closet/dressing room as well as a good size bathroom. The kitchen was large and you could cook there if you like. We opted to go out so we did not cook but you could as it had everything you would need. We did eat breakfast in and it was easy to shop as there is a grocery store just a short walk away. The home was very quiet for the most part. We noticed trash can noises in the mornings but that was about it. It was very clean and well taken care of. It was well decorated too. There was a washer and dryer (stackable) so you could do some laundry. We picked this home as it was easy walking distance to the street car. However, we did not realize that during the weekend before and during Mardi Gras, they have limited service- only running to Napoleon and back. They had bus transfers but we opted to use our car. That was the only disappointment. Otherwise, if you come other times of the year, I believe the street car goes all the way to the Quarter. I would definitely rent this home again when we come back to the wonderful city at the end of the Mississippi! Laissez le bons temps roulez! The house was well-equipped, close-in to all the sights of NOLA. We enjoyed our stay. We were especially thankful that the owner allowed us an early entry when one of our traveler became ill. Tremendous blessing! House has an eclectic feel and was well equipped with everything for a comfortable stay. One tip, it would be helpful to add some hooks in the front bathroom for hanging towels or clothing while showering, as well as additional hooks in the front bedroom since there is no closet. New Orleans is a city unlike any other. Its historic architecture, history (even haunted history! ), the French Quarter, Uptown, Audubon Park, City Park, several famous universities and unique food and cultural have made us famous world-wide. We offer some of the most famous festivals in the world, including Mardi Gras, Jazz Fest and French Quarter Fest, but we celebrate EVERYTHING! There’s a festival honoring someone or something nearly every weekend. But chances are what you’ve heard most about are our food and music and we have plenty of them both all over the city. We have thousands of restaurants, hundreds of music clubs and hundreds more just plain ol’ bars. We love our “cocktails,” which, (did you know?) were invented here! We’re known as “The Big Easy” for good reason: if you can’t relax and have fun here, you may as well stay home!